U.S. President Donald Trump’s daughter and White House advisor, Ivanka, is heading to the Ivory Coast to continue her four-day trip aimed at increasing economic opportunities for women in the West African region. 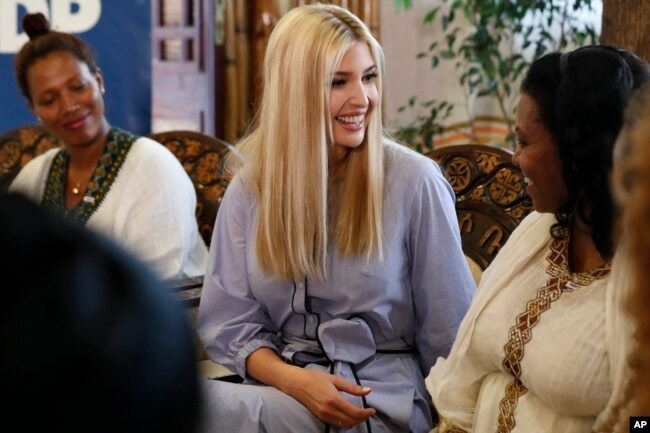 Ivanka Trump, who serves as advisor to her father on economic empowerment, began her trip to the region with a visit to the Ethiopian capital of Addis Ababa Sunday, where she announced a multi-million dollar U.S. government initiative to support women entrepreneurs. On Sunday, Bohigian signed a “letter of interest” with an Ethiopian company called Muya to help support the company through OPIC financing. Muya, owned by fashion designer Sara Abera, produces household products and was the first Ethiopian company to obtain membership in the World Fair Trade Organization.